Will Sam and Dean ever make it to the finish line? 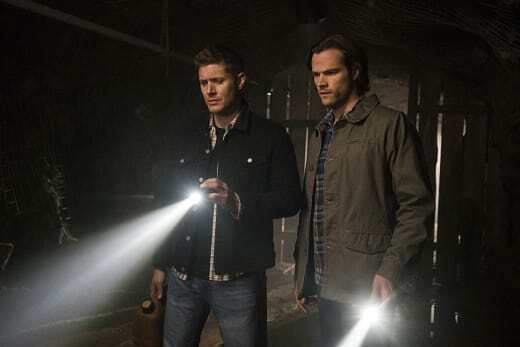 We’ve seen the brothers try to hang up their hunting gear for a shot at a “normal” life before, but the two seem destined to go down fighting the supernatural to the bitter end. And seeing as their battle with Amara remains present even without any leads on where she took Castiel, I don’t see Sam and Dean retiring anytime soon. Maybe after? Is that even possible for the two? There were definitely parallels between hunters Jesse and Cesar and Sam and Dean, but it was interesting to see the divergence of their missions by the end of Supernatural Season 11 Episode 19. The married couple were focused solely on eliminating the cicada spirit that had killed Jesse’s brother 27 years ago. It was, of course, very similar to Sam and Dean hunting down the yellow-eyed demon. But Jesse and Cesar managed to get their closure and find victory in their pursuits, and the two were simply done with hunting after that. 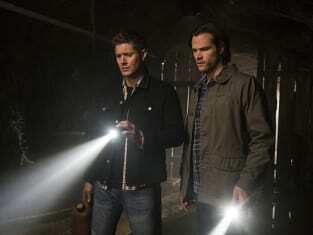 Sam and Dean, however, found themselves deeper into the battle of the supernatural after killing Azazel. And they’ve been going ever since. On the one hand, I was a bit disappointed Jesse and Cesar were done because I was excited at the prospect of seeing these two return (though, they still could at some point) to perhaps help Sam and Dean with Amara. On the other, I liked seeing something of a happy ending. All too often, we see hunters get killed off or keep on going till they get killed off. I even expected one of them to turn or get killed in the process of hunting down the creature of the week. It also was good seeing Dean keep quiet about asking for Jesse and Cesar’s help. He was letting them reach their finish line and stay there, even though I’m pretty sure they would have been willing to help out Sam and Dean. Aside from the parallels, it was great to get some new interesting characters to expand the world. Plus, I really liked how the intro wound up connecting later in the story as more of a flashback rather than just some random kids getting taken. It added some emotional weight to Jesse’s hunt. There were a few times where it felt like Jesse was a bit over the top in his anger, but I liked his and Cesar's story in general, so it really didn't bother me too much. I also really liked getting a brand new creature rather than another vampire or werewolf story. I immediately thought of the horror film Jeepers Creepers when there was discussion about the creature showing up every 27 years. Also, there was something very creepy about the “turned” people with their shaking bodies and green eyes. The sound effects definitely had a lot to do with that, and the search in the cicada spirit’s lair captured that dark, scary hunt that Supernatural has done rather well. Who else is going to be hearing the chitters for the rest of the night? I really was expecting a boring case of the week that was just meant to fill in time until everything goes crazy with the bigger mythology in the final episodes. And yet, this was a solid, engaging hour that gave us new characters to care about and a new creature to learn about. But it also really made you think about Sam and Dean’s relationship, their everlasting hunting, and what might be in store for them at their finish line. What did you think of Jesse and Cesar? Will Sam and Dean get an ending like Jesse and Cesar or will it be going down guns blazing? Sound off below and make sure to watch Supernatural online now! NOTE: Supernatural Season 11 Episode 20, "Don't Call Me Shurley," airs May 4 at 9 p.m.